This tutorial was originally written for ZBrush 3.5 R3 so the interface shots will be slightly different from the latest ZBrush version. It shows how the ‘ReMesh’ and ‘Mirror and Weld’ features make creating complex shapes such as Crown Molding is nearly effortless. The order of the SubTool determines the order of the Boolean operations; so, make sure that subtraction elements do not subtract from wanted addition elements. (Changing the icon on the SubTool will determine if each SubTool will add or subtract. The order of the SubTool menu can also be reorganized as needed.) Change Res to ‘512’, and Polish to ‘1’ (Changing Polish to ‘1’ will generate harder edges during ReMesh.) Click ‘ReMesh’ All. 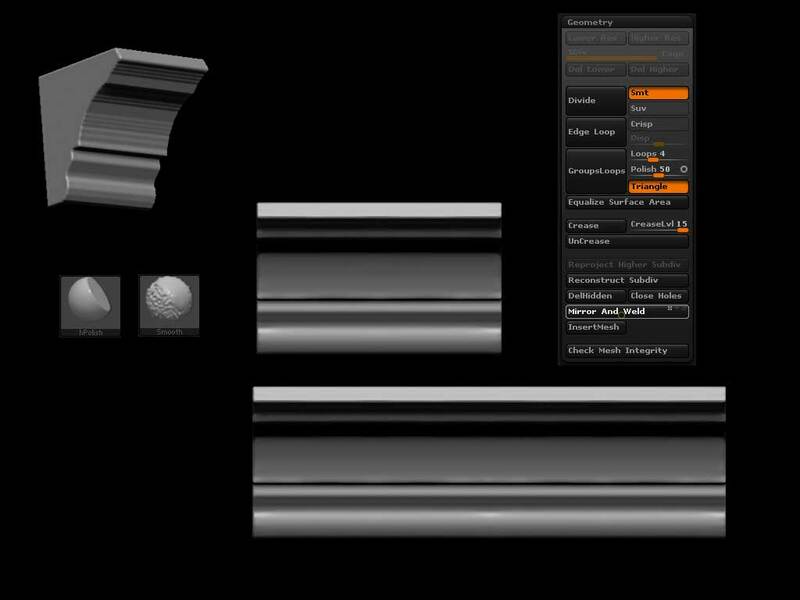 ZBrush will process all the SubTool actions in order and generate a new SubTool. The new ReMeshed SubTool may need a little cleanup after generation, use ‘hPolish’ brush and ‘Smooth.’Next, turn on Grid and using Transpose position the SubTool to the left of the center axis line and use ‘Mirror and Weld.’ All elements of the SubTool will mirror on the left side to the right and update the SubTool. 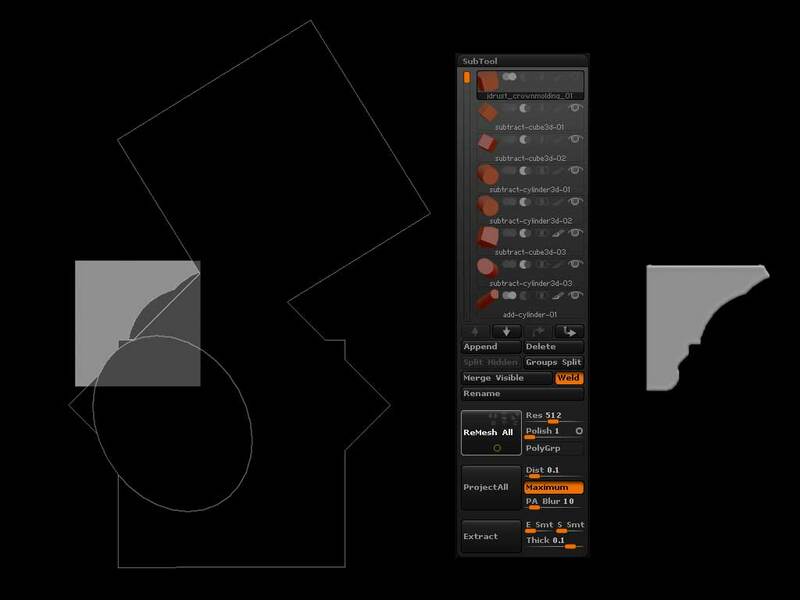 Using Rotate in the Deformation tab and Tranpose rotate and move the model. 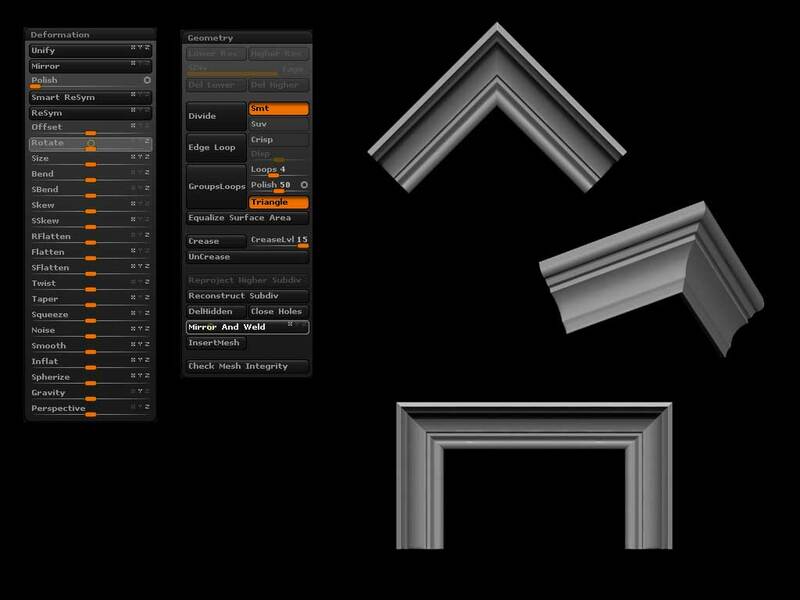 Then Use ‘Mirror and Weld’ to generate, mitered angles, coping, and other returns. (If only creating crown molding in real life was this easy.) 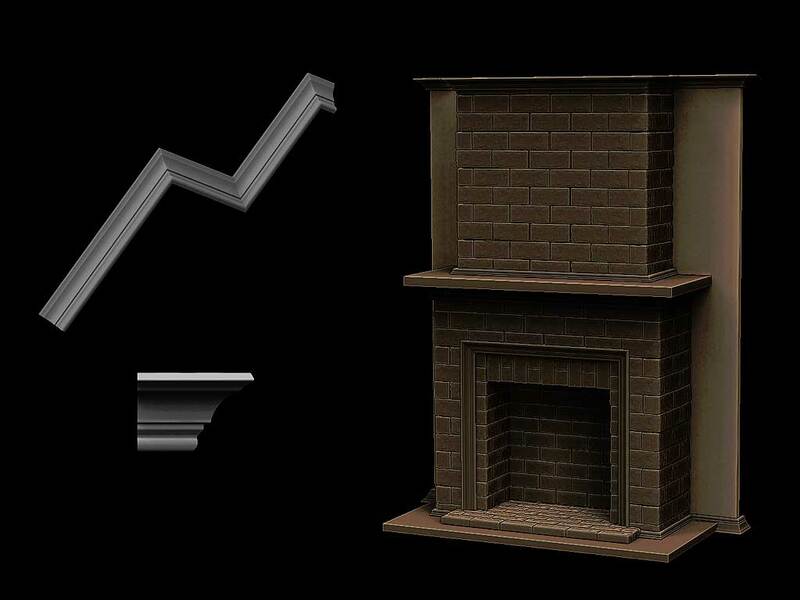 ‘ReMesh’ and ‘Mirror and Weld’ are not only limited to creating Crown Molding, most angled hard surface objects can easily be created using these methods.